"Too much is riding on stocks to let them drift lower. 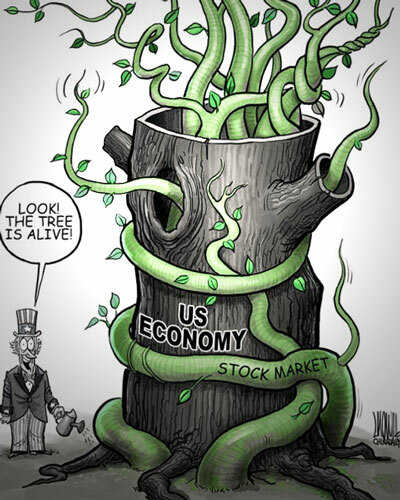 The stock market is not only the critical signaling device that tells the world all is well and everything is getting better every day, in every way, it's also the collateral for all sorts of highly profitable schemes, and the financial foundation of the institutions that are supposed to fund pensions and fulfill insurance redemptions. And even more important, the stock market is the money machine that enables CEOs and top management to push their stocks higher with buy-backs and then cash out their personal stock options for glorious millions. By making the stock market the only game in town, the Powers That Be can no longer afford to let it decline for any reason: technical, fundamental, quantitative, it no longer matters--stocks must drift higher forever without disruption. This is what happens when you strip out volatility and game the system: the system loses all natural resiliency and becomes increasingly brittle and fragile. The only way to make sure it doesn't tremble and shatter into pieces is to guarantee that no decline will be allowed. Of course then you don't have a market--you have a simulacrum market, a phony fragile shell propped up for PR purposes."